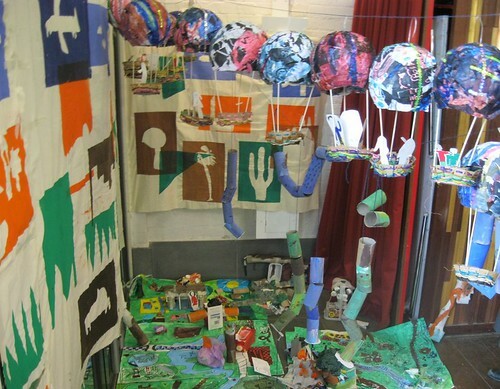 My Adventurers Art Club and I spent the entirety of last term working towards a 'grand landscape installation', which we spent a glorious hour putting together with the help of George, inspirational volunteer, in the last Art Club of term. I have never known a group as young as this to be quite so brilliant at collaborating, and the joy in watching them debate where to put things and how to arrange them is the best return for hard work that anyone could ask! 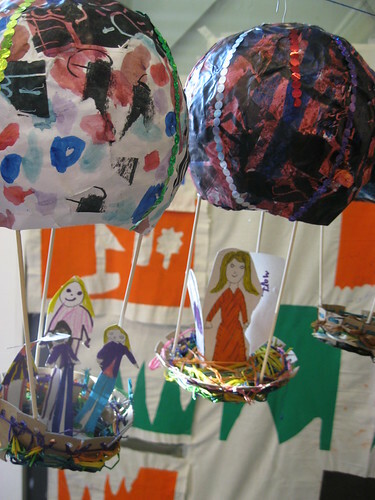 The project began with drawing our dreams and aspirations, inspired by an exhibition in the Stables Gallery, and then using torn up photocopies of these to create papier mache hot air balloons. Meanwhile, we created a collaborative scree printed landscape to form a back drop, painted toilet roll middles to hang as part of the sky and the trees, and constructed a 'bird's eye view' of Richmond for the ground.